Whilst enjoying my sojourn in Vietnam, I discovered a new luxury oasis. 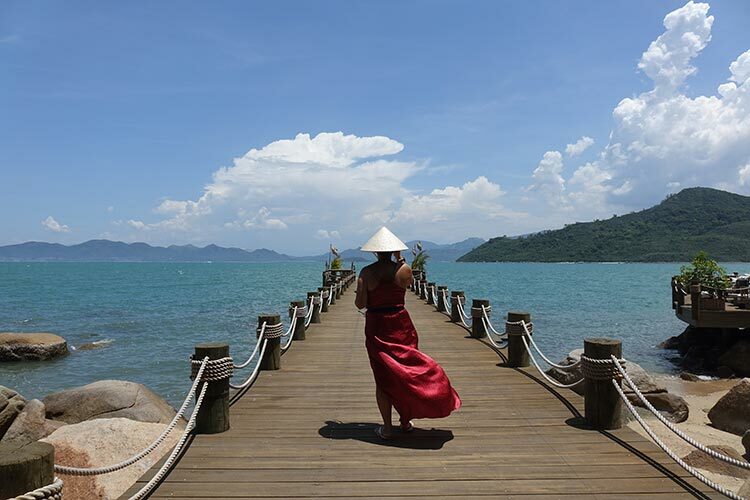 An artful blend of luxury in an exceptionally designed resort that is sympathetic to the surrounding environment, An Lam Retreats in Ninh Van Bay ticks all the boxes. 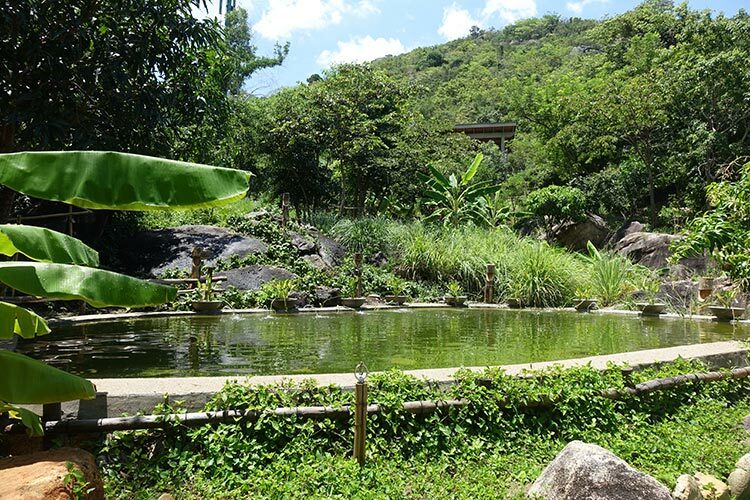 I was needing an oasis of relaxation and restoration for my body, soul and mind. What really impressed was that it wast tucked away and only accessible by boat, located on a secluded peninsula 25 min from mainland Nah Trang. It is a sanctuary of nature, lush gardens and a unique building designed and inspired by the local Lotus flower, or in Vietnamese, called Sen.
From a distance, I was so excited by this architectural masterpiece that stood out, but also blended into this amazing setting. 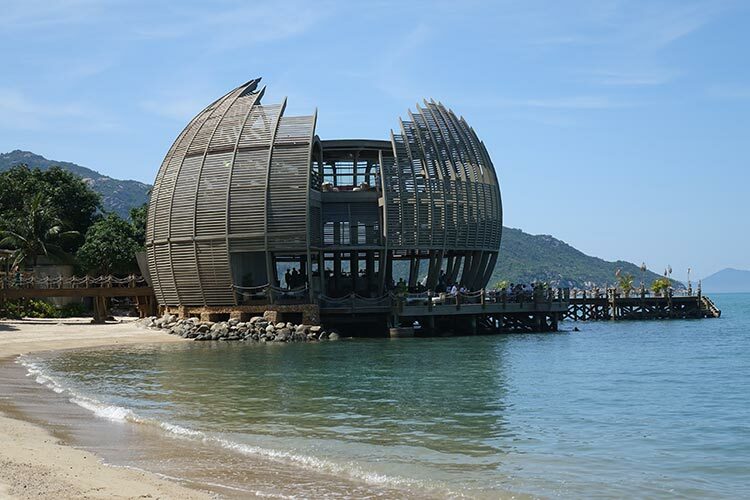 Constructed from wood imported by New Zealand, teamed with local bamboo design, this bar and restaurant is an example of the passion and commitment to An Lam Retreats. This Grand Design, where humanity meets nature, takes you on a journey to a lifestyle utopia. 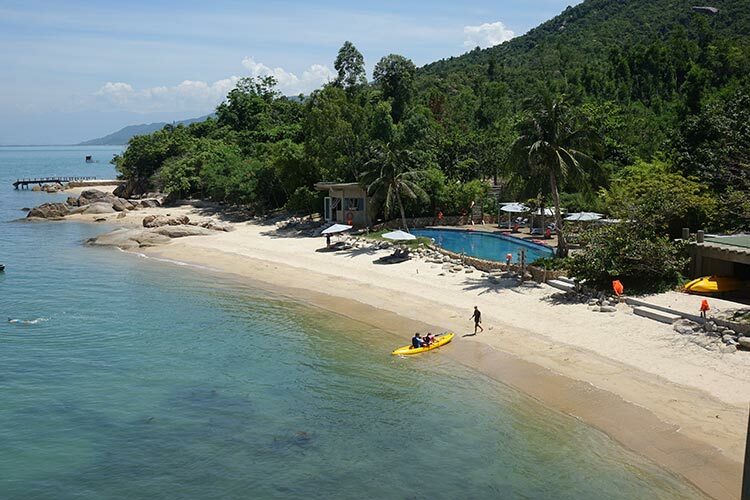 The resort is beautifully set in the splendid Ninh Van Bay, which is an exclusive area of Nha Trang. It is serenity personified, with clear water and a golden sandy beach, with soothing vistas over to the bay. I was welcomed at Cam Ran airport by a luxury VIP vehicle complete with classical music, setting a tone activating my senses. From the airport it is about a one hour drive before connecting to a boat, at a dedicated reception area on the mainland. Its setting is a lovely introduction to what awaits. I loved this concept because from the moment I set foot onto the boat, I did not have to worry about my luggage – the journey had began. The lurking seagulls that surrounded us seemed intrigued by those who were coming into their world. 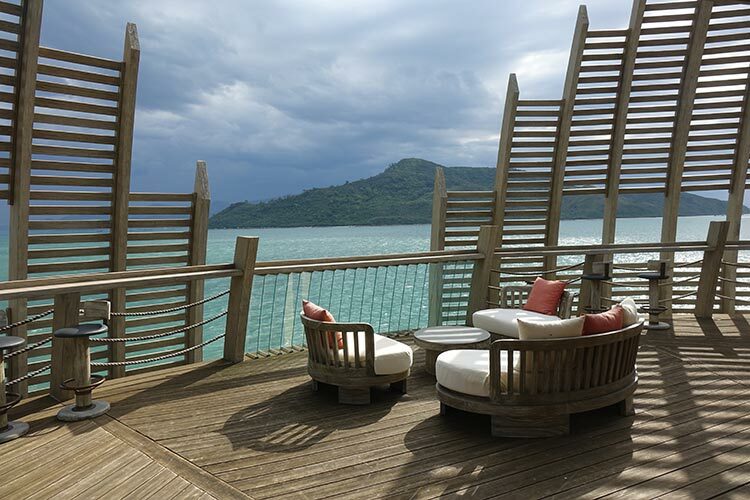 Upon arrival at the resort’s nice wooden jetty, we were greeted by the warmth of the staff. 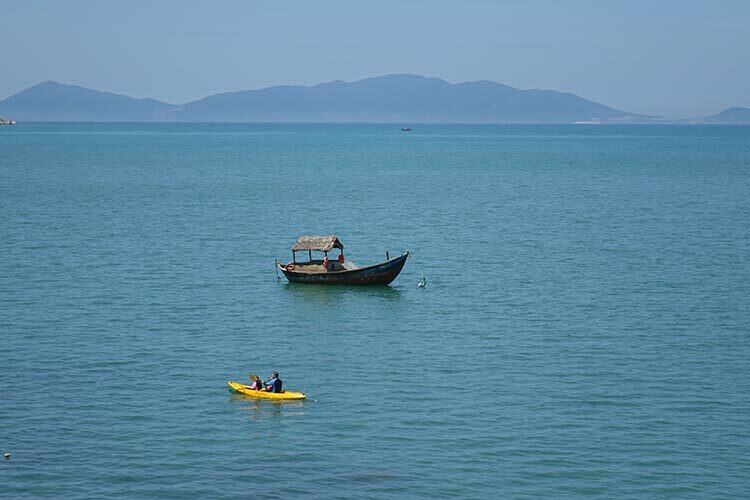 I was invited to immerse myself in the sincere, untouched tropical environment that surrounds An Lam Ninh Van Bay. 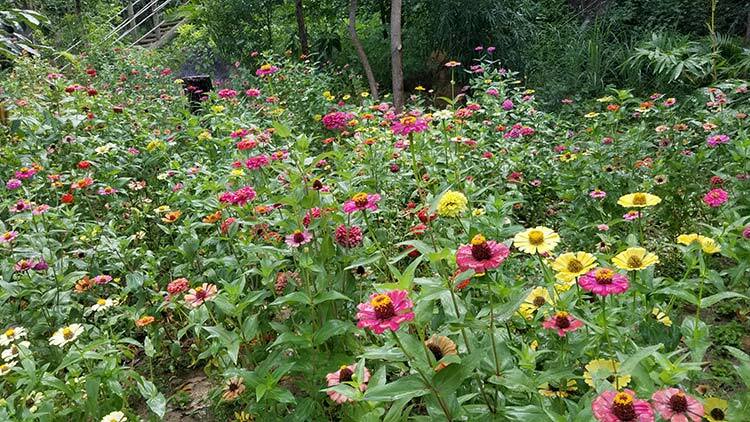 The pristine gardens, the aromatic mango trees and the beautifully colourful flowers throughout the retreat reminded me of the wonderful simplicity of nature. 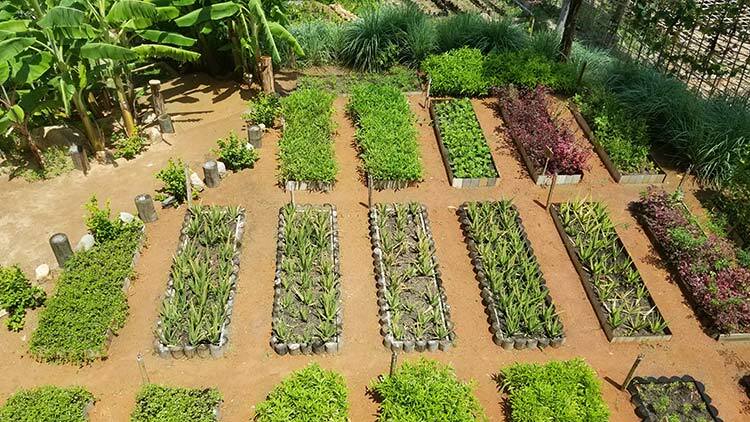 This retreat is dedicated to the protection and conservation of the environment and is governed by eco friendly values and practices. 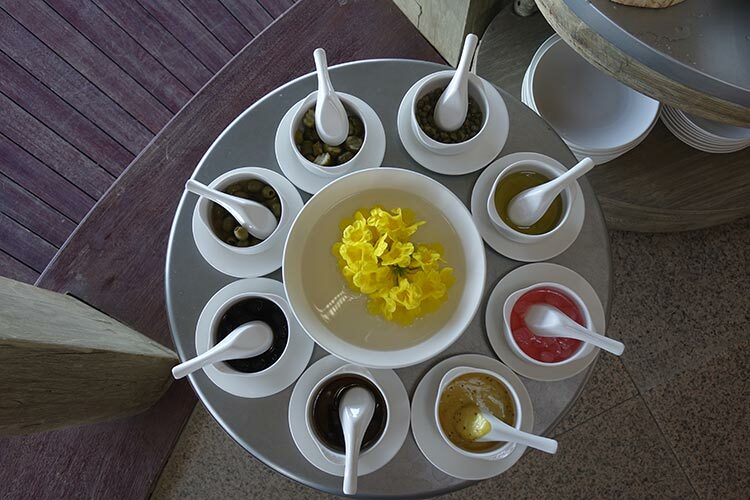 The food here at the retreat is fresh, locally grown and delicious. 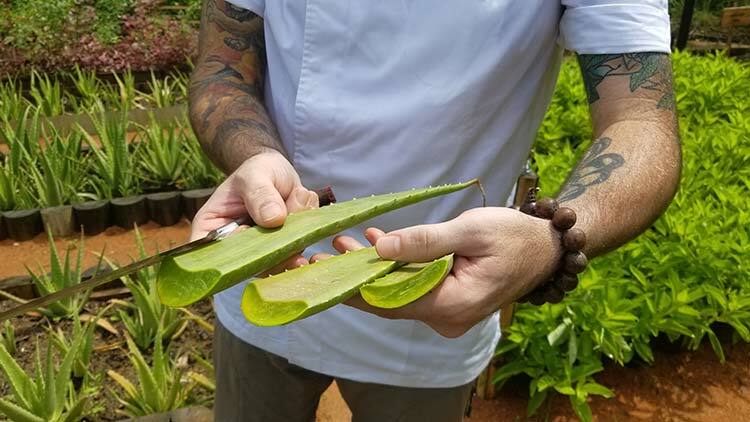 I loved meeting the resort’s culinary genius, Master Chef Jamie, shares is affinity with the Aloe Vera plant. 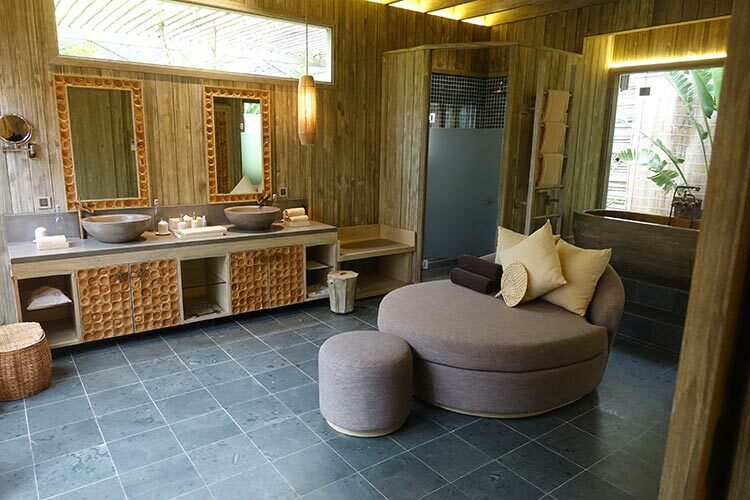 It is used throughout the retreat, both in the food and their Jungle Spa. Vietnamese pride themselves in serving their guests. This was reflected by each member of staff and their heartfelt culture in making sure I was happy. I was offered a personalised butler who was both intuitive and discreet. 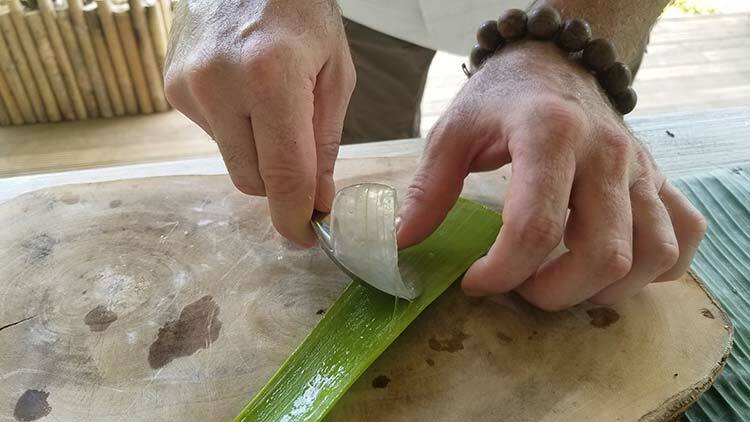 On one occasion during my cooking class, I placed the Aloe Vera on my sunburnt nose. When I returned to my Villa, I was greeted by my surname on a plank of wood, followed by a huge bowl of fresh cut Aloe Vera. It left my skin hydrated for hours and it felt amazing too. 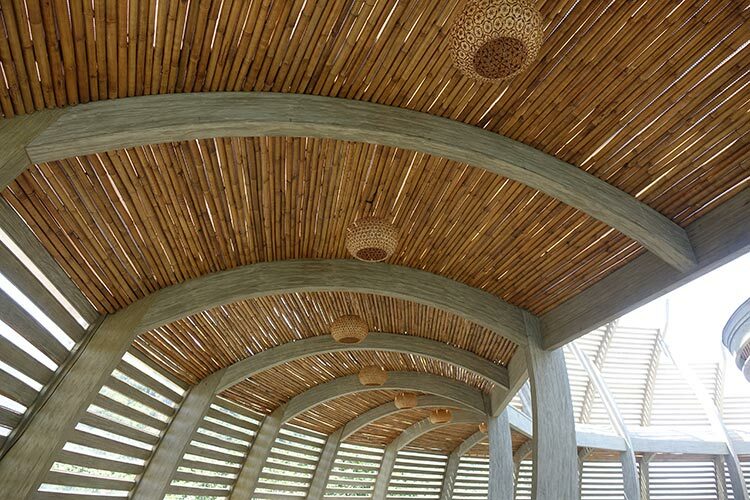 The knowledge, passion and expertise for Vietnamese architecture resonates throughout the retreat. Using the skill of local culture, every handcrafted piece of wooden and bamboo furniture is a modern, functional and contemporary piece. 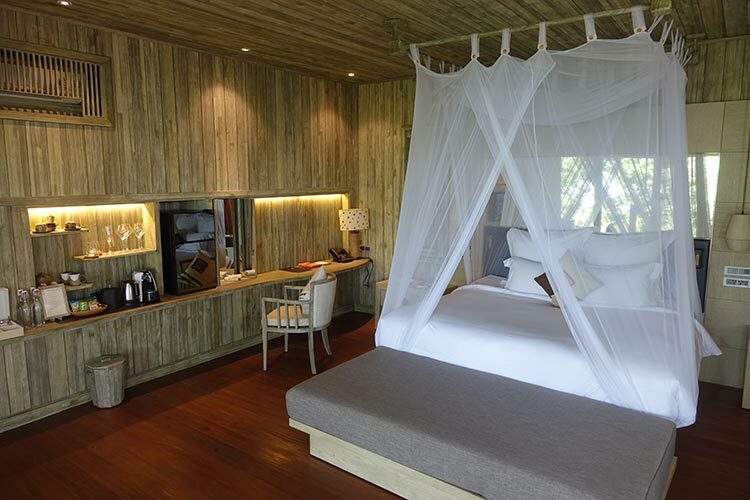 I took the time to feel and observe the bespoke furniture throughout the resort and it is of high quality. 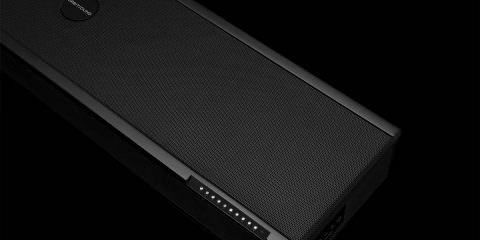 I loved the bedside draws – they were a quirky, unique way of storing my personal belongings. The furniture is made of natural materials, handmade textiles and earthy colours reiterating that An Lam retreat exudes nature. 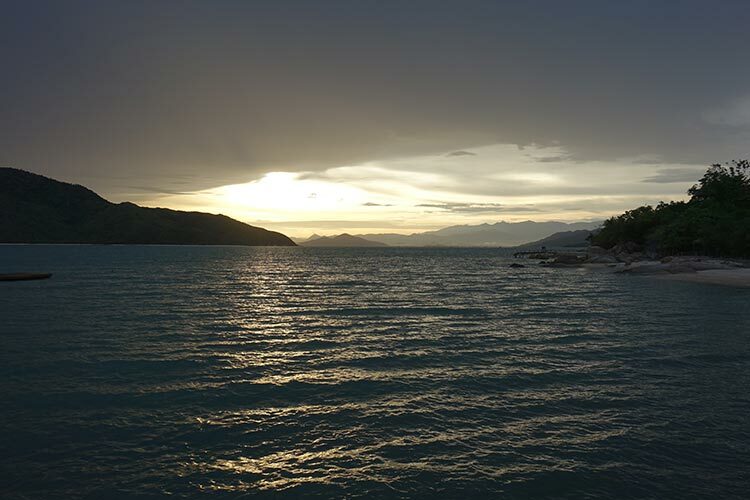 Throughout the retreat and its villas of calm, light filled spaces, I bonded with mother nature. This is an amazing setting in which to eat and the food is excellent. The food where possible is locally grown. It is well presented and the unique dishes are divine. 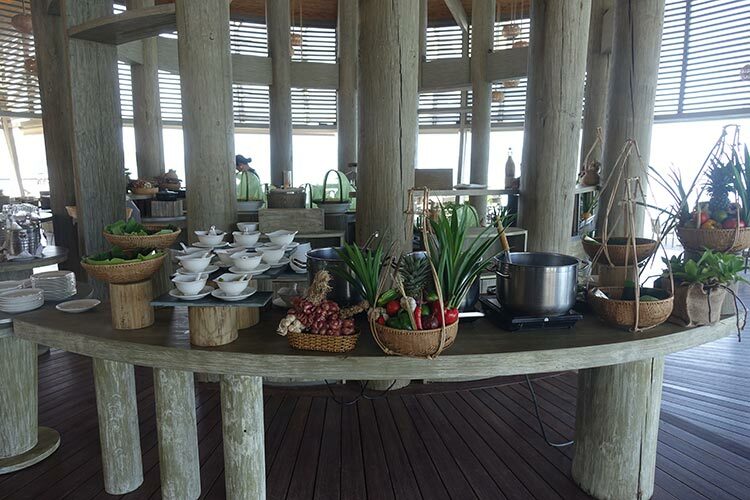 Each day for breakfast a variety of dishes were served. 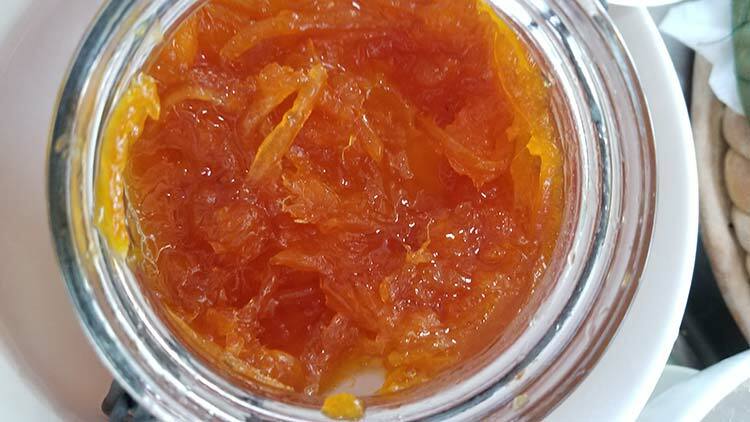 The homemade marmalade jam is why Paddington Bear and I were at war with each other every morning for breakfast! In Vietnamese culture, anything and everything for breakfast is the norm. 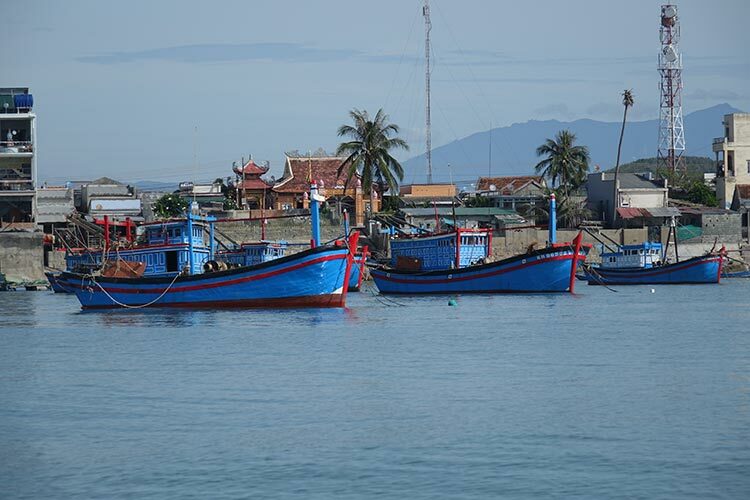 Fresh, local fish is also served incorporating core ingredients such as lemongrass, ginger, chilli, coriander and lime. The dedicated crepe and egg station with endless choices is a real treat. Fresh, traditional Pho soups are served with your choice from a range of sauces. There is an excellent selection of European options too such as French cheese, olives, salami and honey ham. The bread and pastry options are just as good as the patisseries in France. Vietnam is a huge exporter when it comes to coffee. 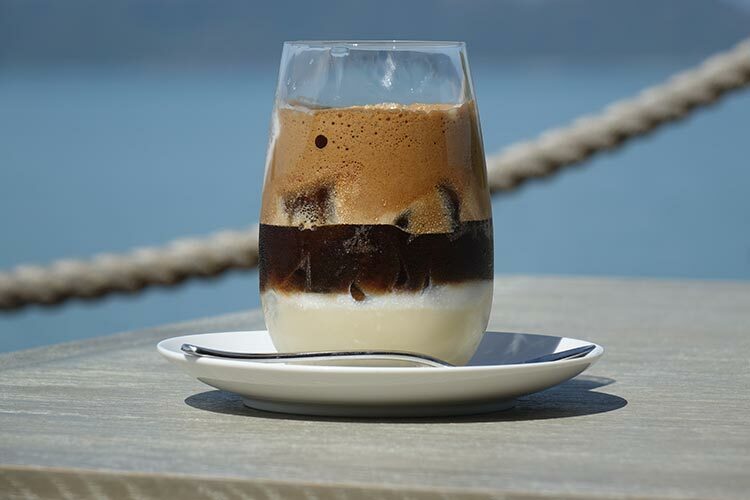 Their traditional coffee served with condensed milk is a must try. Here at an Lam they serve a unique attention to detail coffee that left me gagging for more. Afternoon tea is served here and each day I was presented with delicious homemade style cakes accompanied by fresh local jams. The ice tea is made and fresh produce from their gardens and it is a brilliant detox for the body. 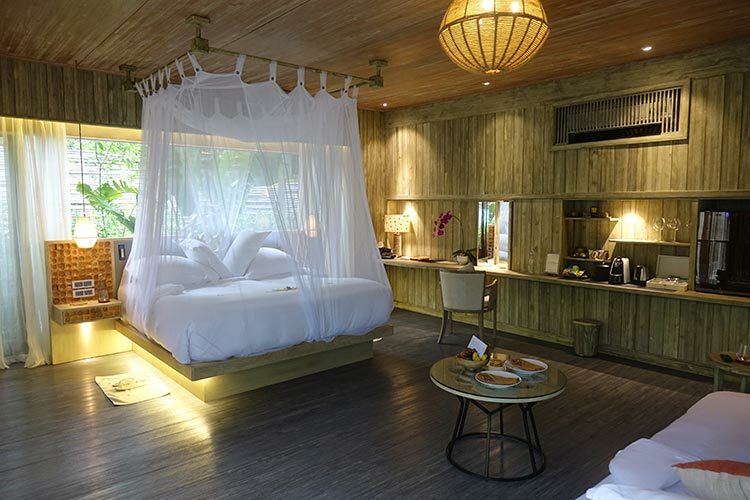 There are only 34 luxurious and spacious timber villas, many with veranda, plunge pools and green tropical jungle. I stayed in a 95 square metre, Beach Pool with Beach Front view. This view was stunning and the jungle garden surrounding my private pool was gorgeous. At night I could hear nature itself, plenty of frogs to team up with and the sound of local fisherman working during the night. A nice reminder that Vietnam is still very primitive when it comes to sourcing food. The sun loungers are very big and comfortable and were great to work on early in the morning. A dedicated coffee machine was handy to keep me awake from jetlag. The fresh tea with lovely teapots were a nice touch to create my own tea setting. The bed and bed linen were super comfy and the massive pillows combined with white netting just set the tone. The bed was super inviting when I needed to just catch up on sleep. The furniture throughout the villa was lovely. The use of bamboo design here especially on the draws and cupboards were very chic and edgy. The overall interior design was fantastic and just created such a relaxing environment. The floor to ceiling windows allowing me to overlook the garden and the sea was a beautiful way to take in nature. The electric curtains were excellent to shut off all light when I needed some more resting time. 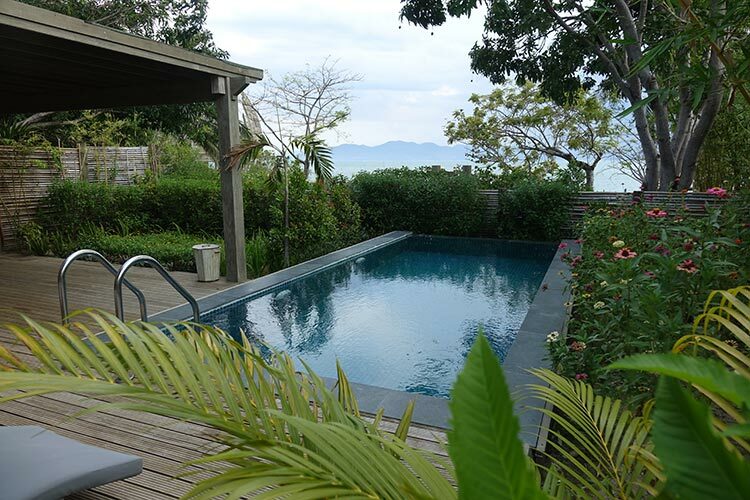 This spacious villa was just perfect for taking in the best of what Vietnam has to offer. The wooden bath overlooking nature itself with a huge window was stunning. Being able to open the window to feel and hear nature itself was very relaxing. Teamed with bath salts, endless amounts of products on demand and then been able too look out into the sea itself was a luxury experience in itself. The sink copper taps were the coolest piece of engineering I have seen. 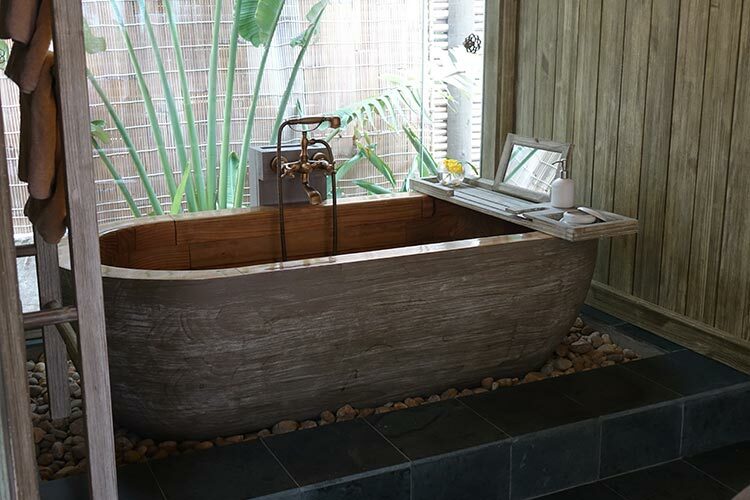 The water flow functioned as a natural waterfall itself and the double sink bowl looked and felt amazing too. Again through out the retreat the use of bamboo framed mirrors and doors were very edgy indeed. 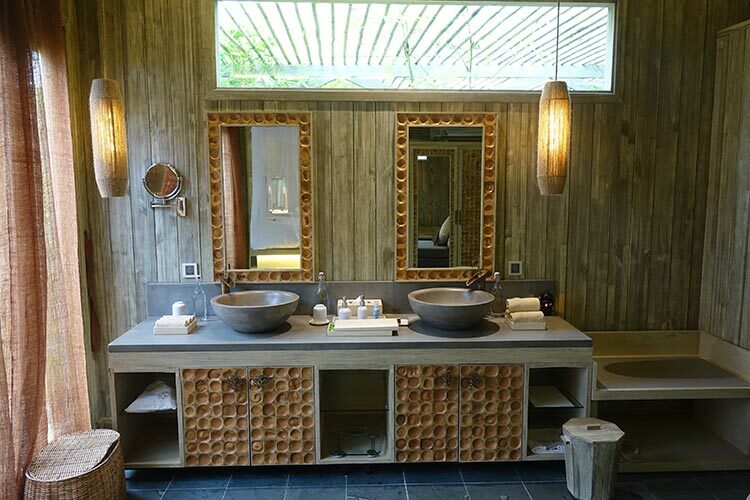 The storage was more than ample and again the use of New Zealand wood and local bamboo design is why this villa was so easy to relax in. The design allowed me to stay cool but also include nature surroundings as part of my stay. There are plenty of things to do at your own leisure. I chose the head massage course which was perfect for to learn the art of getting tension out of my neck and shoulders. The jungle Spa setting is brilliant. I loved the cooking class in where a private tour of their local produce was given. Been able to pick the food too and learn so much about what time and effort goes into the food preparation here is mind-blowing. Making rustic, organic prawn soup was a fabulous reward for all my hard work. I also opted for a yoga class with amazing views of the bay. 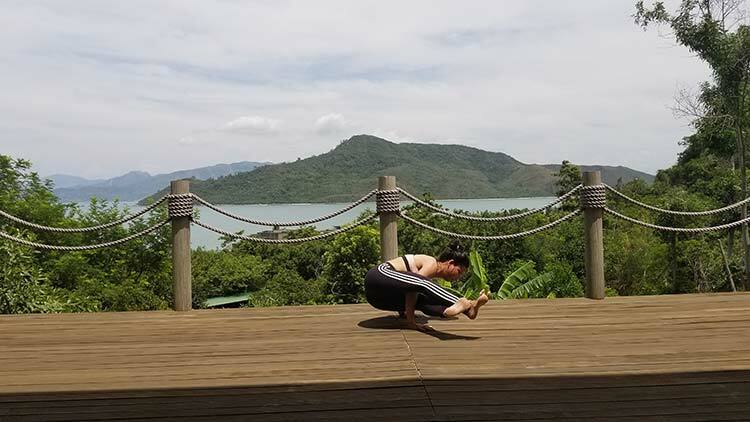 This was an excellent way to learn how to stretch those muscles and release the mind into calm mode. I could go on bike riding adventures and walk up to their natural stream in where all their local water I drank is from. Make sure you take the time to do this as the views and nature itself is wonderful. 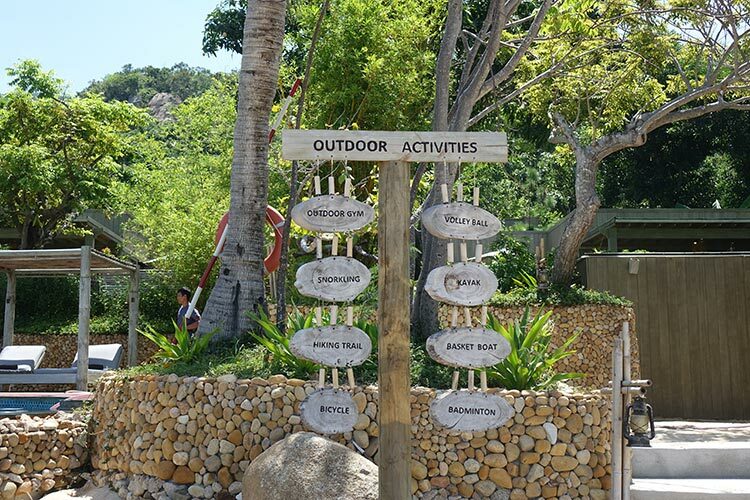 Kayak’s are available to venture around the resort and also to be able to snorkel too. The water is clear and just stunning to swim in. 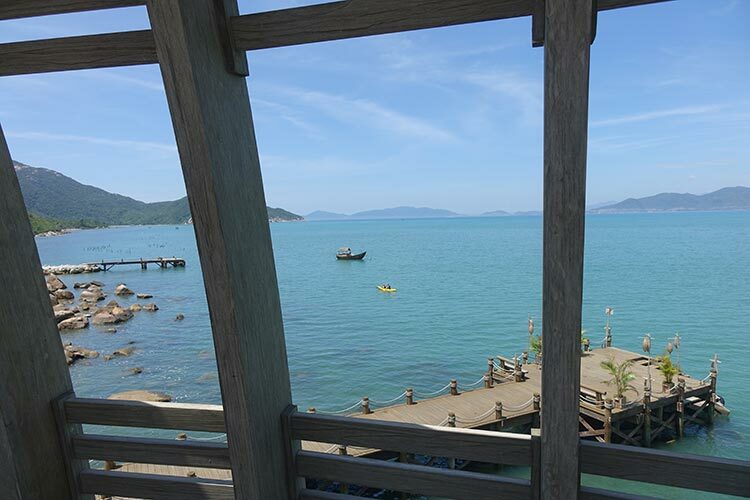 An Lam Ninh Van Bay is a retreat where outside the summer holidays no children are allowed. As a mother of two, this is the right decision. This is a place for adults seeking one on one with each other and nature. Opening in late 2019, An Lam Reatreat just near by are building, 3 bedroom villas which offer a private chefs. 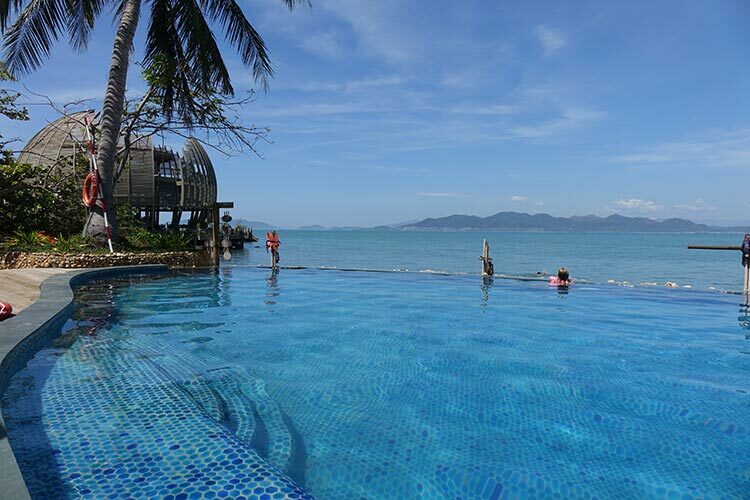 Even though I had my own private pool, there was nothing better than to swim in the larger an infinity pool overlooking the bay. Both day and night I loved doing this and listening to the sound of the water and nature itself. 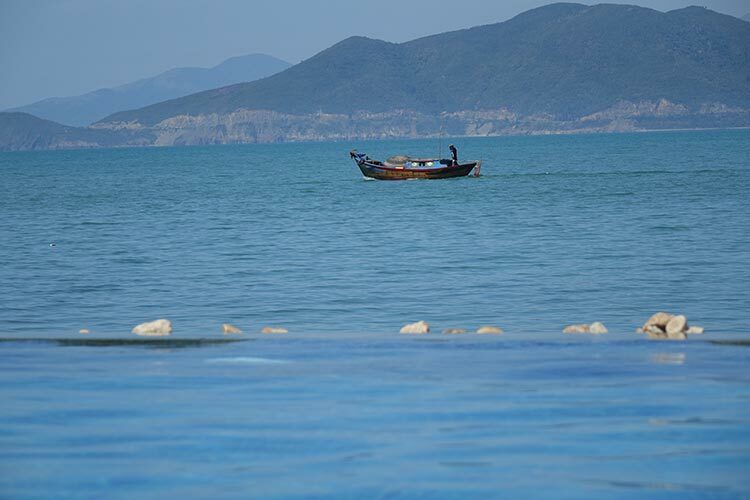 Both day and night I was reminded of why An Lam Retreats Ninh Vam Bay is a must visit. Throughout my stay the sound of nature itself was rare and much needed for me. Places like this are hard to find and if you are looking for an experience to celebrate life itself, with only the sound of nature itself, then this is the place to do it. 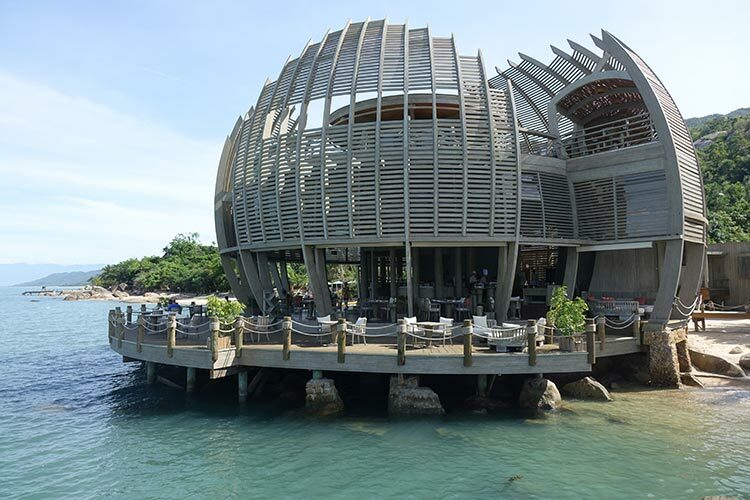 Whilst swimming, I could not stop overlooking the Sen restaurant and this amazing Lotus Flower inspired building.